Video shows a Jersey Shore shopkeeper telling a group of young black girls from Clifton and Paterson that they weren’t welcome in the store, leaving their parents -- and the innocent children themselves -- all wondering what happens now. The employee who kicked out the girls was suspended Sunday amid an internal investigation that led to her being fired, a spokesperson for Jenkinson's Boardwalk said Tuesday. The children are in a special all-girls summer camp that gives them “a safe place to adjust, to self-express and to basically just do girl stuff,” said coordinator Attiyaa Barrett. Now in its fourth year, the "Princess to Queenz" program allows the girls to choose a field trip destination each week. Together, they raised $1,400 through a GoFundMe campaign, collections and donations from a couple of parents who paid for their daughters plus one. They chartered their own bus for the 90-minute ride and “were singing the whole way,” Barrett said. The 40 girls, nine chaperones and two parents who came in their own cars walked along the Point Pleasant boardwalk and ate lunch on the beach. Then they went to Jenkinson’s Aquarium. Seven girls stayed in the shop and began looking around. One is seven, the others 12, 13 and 14. So the girls came out and got one, then headed back inside. Barrett quickly moved in front of the girls. “What happened?” she said she asked the woman. In the video, the woman says the girls didn't have a chaperone at first -- then that she didn't believe the woman they brought back with them was one. "And then what did you say?" Barrett asks her in front of some of the youngsters. "They're not welcome in here,” the woman replies. Regaining her composure, Barrett went outside with the girls. “I reminded them of the three rules we have in our program,” she said. “Rule Number 1 is to be my sister’s keeper,” Barrett said. “I thanked the girls who got the others out of the store. “Rule Number 2 is to respect the queen in the room. I thanked them for respecting the queen in the store, even though she wasn’t behaving like one. Security arrived with questions for Barrett. The aquarium worker showed the recording. Another woman, her husband and her mother all told security that the shopkeeper “kicked the girls out before they had a chance to buy something,” Barrett said. That planned was scrapped, however. “The girls were all crying,” she said. Some cried on the way home. Another said she was angry, that what happened wasn’t fair. Aquarium officials called Barrett last night. 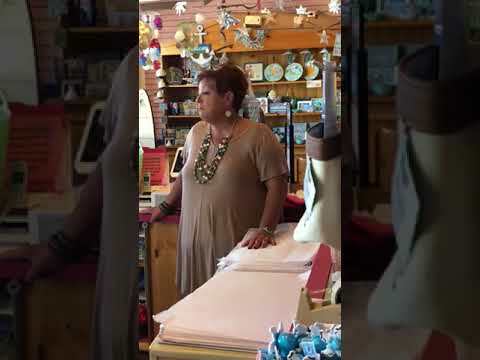 She said they apologized, explained that the gift shop if part of Jenkinson's Pavillion -- and not part of the aquarium -- but promised to investigate and then decide how to deal with the situation by Monday. Once she has an answer, Barrett said, she’ll sit with the girls. Already on Saturday she’d heard from several parents, all of whose daughters want to know: "Now what’?" “I’m going to have to have an answer for them,” Barrett said. ALSO SEE: Authorities identified a Little Falls mom accused of leaving a 3-week-old boy in a hot car while she went grocery shopping in Clifton.